The US needs a strong Iran to use as a continuous scarecrow to frighten Middle Eastern countries, mainly Saudi Arabia, the Emirates and Bahrain. The aim is to blackmail these Gulf countries and sell them US arms, transforming the Middle East into a huge US weapons warehouse. Diplomatic sources confirm Iran has never declared war on Saudi Arabia or any country in the Middle East with the exception of Israel. It is common knowledge that Israel is the one taking the initiative assassinating Iranian nuclear scientists, violating the Lebanese and Syrian airspaces and recently bombing an Iranian command and control base at T4 (combating Jihadists) killing 7 Iranian officers. 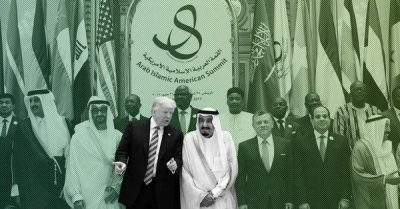 The US establishment, since the rise of the Islamic Revolution in 1979, has been in need of a ghost enemy with which to threaten the rich Gulf countries. Their purchase of these US weapons has great impact on the US economy and is a significant source of income for the US. This need is related to Iran’s success at remaining outside the orbit of US dominance for the last four decades. Iran is very careful in dealing with or supporting Shia communities living in Gulf countries, for example Saudi Arabia and Bahrain. Tehran is aware that any support for these may trigger harsh repercussions by monarchies against their own nationals under the pretext of their being supported by a foreign state. Iran was particularly watchful when dealing with Sunnis in Iraq, Lebanon and Palestine, aware that any Sunni-Shia conflict would be detrimental to the entire middle eastern region. And lastly, neither the Shia nor the Sunni can eliminate one another: they have no choice but to live together somehow in a multi-religious-ethnic-secular region. These are enough reasons for Iran to keep away from attacking any of its neighbours. The entire world would stand against any similar offensive, if ever planned, including Russia, Iran’s ally. “many states in the Middle East won’t last more than one week without the US protection”. “I want money, money, money. The Gulf countries have a lot of money and I want it”. Trump, when dealing with the Gulf countries, seems like a thirsty man drinking salty water: the more he drinks, the more he needs. Unsatisfied despite tens of billions of dollars’ worth of weapon contracts with the Gulf countries, Trump is always asking for more, more financial support. This is why Trump desperately needs to portray Iran as the source of continuous threat, so that he can pursue his insatiable financial objectives. If we take the excuses of the US President regarding Syria, he claimed that the presence of his forces aim to block the road to Iran’s expansion in Syria and its link to Iraq. Actually, this is a clearly false statement because in fact this is the first time since 1979 that Tehran is physically linked to Baghdad, Damascus and Beirut by land route after albu Kamal was liberated. Therefore, the presence of the US forces in Syria is far from being linked to, or justified by, Iran’s presence. However, it is a suitable excuse for pumping more money from Saudi Arabia, the Emirates and perhaps Qatar so Arab countries can finance the US presence in Syria – even if these Gulf countries have nothing to gain from it. Trump is asking for more money to rebuild what the US forces have almost completely destroyed, the city of Raqqah. The US president is imposing on the Arab oil-rich countries to rebuild the infrastructure in the north-east of Syria so the US can pretend to support the locals. The Arabs are aware that both the US and France (whose forces are increasing in northern Syria) will pull out when exposed to heavy insurgency attacks by locals who will definitely fight the occupation forces, similar to what happened in Lebanon in the 80s. Diplomats believe the US-Israeli decisions and attitudes towards the Palestinians play in favour of Iran. Trump has declared Jerusalem as the capital of Israel and the forces of Tel Aviv are indiscriminately killing civilians during manifestations in Gaza. Moreover, when the Gulf countries stop any financial support to the Palestinians, they are pushing many of these Palestinian groups into the arms of Iran, the only source of support which hasn’t stopped throughout the years. According to the sources, Israel – self-declared as the only democratic country in the Middle East – and the US should give the Palestinians their rights of existence to live in peace in their land, their capital, the right of refugees to return, and stop the killing of civilians. The large Russian community in Israel and among its leadership seems insufficient to persuade President Vladimir Putin to play along with Tel Aviv’s current policy. Russia wants the end of the war in Syria, while Israel wants the war to continue and the US is throwing wood on the Syrian fire, blaming Iran over anything it can. The US is still holding many important cards in Syria to use and prevent the unity of the country. However, Damascus and Iran won’t stand still, watching or on the defensive. How long can Trump keep his forces occupying part of the country? Despite his contradictory statements (will pull out…will not pull out? ), would he keep forces if suffering heavy casualties? The attacks against these forces will take place sooner or later. Neither the US nor French forces will escape from the path they are headed towards, and it seems they are unwilling to learn from history, ignoring what happened in Beirut in 1983. Iran was there, present in Lebanon, and today, it is also present in Syria.